Set in the glistening blue waters of the Mediterranean Sea is the magical, ancient paradise of Crete. 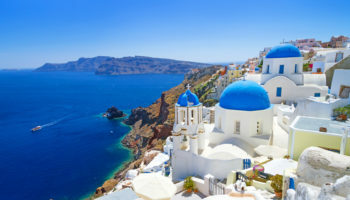 The biggest of the Greek islands, Crete is awash with culture, history and vibrant local life. Take a trip to the magical island and spend days lapping up the Cretan lifestyle on its stunningly picturesque beaches, lost in its age-old architecture and delighting in the depth of the fresh, local cuisine. Sleep in luxury in one of Crete’s stunning Venetian villas or find a place to stay on a budget in a family friendly holiday resort, or even base yourself in a party town alongside other clubbers. 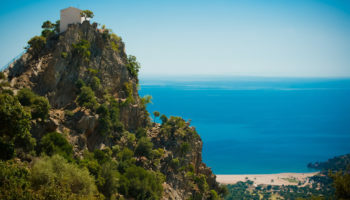 There is always something new and interesting to explore in Crete and, even though there are numerous local buses that connect towns, the best way to see all of the top sites on the island is to rent yourself a car and travel around at your own pace. There are so many beautiful beaches to seek out on the island, some of them only accessible by boat – why not set sail on the gentle lapping waters of the med to secret bays along the coast? 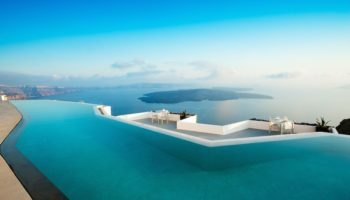 There is something on the enchanting island of Crete for everyone, so we have rounded up the best places to stay in Crete to make your holiday even more perfect. Cosmopolitan Chania feels like the capital of Crete, with its attractive architecture and the dramatic White Mountains looming over the city. Chania is made up of a beautiful mix of Venetian buildings that surround the famous harbor. Spend your evening in the relaxed romantic atmosphere, dining along the illuminated waterfront. Discover a whole jigsaw of history in the remarkable town, wander the narrow old lanes and find out the secrets of the city for yourself. Stay in one of the cities old Venetian villas that have been converted into impressive hotels or one of the stylish mid-range hotels. It is easy to find delicious food, a nice spot for drinks, or a spot of shopping along the city’s labyrinth of old lanes. If you want to explore further afield there is a local bus that connects to other towns and a ferry service, too. Casa Delfino Hotel – For a slice of true luxury, you should book yourself into Casa Delfino Hotel & Spa; set in a 17th century Venetian mansion, this 5-star offering really oozes class and sophistication. It’s a family run boutique hotel that’s just a 7-minute walk from the old Venetian Harbour, and a mere three minutes from the historic Etz Hayyim Synagogue. The rooms at the hotel are beautifully done and some come with individualized decor, jacuzzis, or terraces with harbour views. For some relaxation check yourself in to the rooftop spa. Kydon The Heart City Hotel – Set in the center of the city, opposite the main market and close to the Venetian Harbour and Old Town, this hotel is in a great location for those wanting to be surrounded by shops and restaurants. Renovated, contemporary rooms feature plush carpets and balconies with views over the old rooftops. Staff here are very pleasant and professional and serve up delicious food in the hotel restaurant. There are family rooms on offer and the hotel has a child friendly environment. There are also extra touches to keep everyone entertained here, from access to free bicycles, to games consoles, and Apple TV. Porto Veneziano Hotel – A modern 3-star hotel that offers up harbour views, staying at Porto Veneziano Hotel means being a stone’s throw from the sun, sea, and sand of Paralia Koum Κapi beach. Back at the hotel, rooms are minimally decorated for a touch of simple style, whilst suites feature luxury marble bathrooms. It’s great value for money, since parking, bicycle hire, as well as breakfast are included in the price. 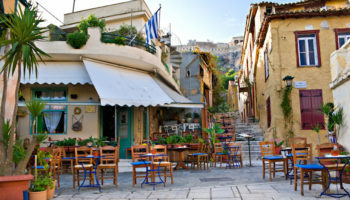 For a slice of culture, the Venetian harbour and the Archaeological Museum of Chania are within walking distance. Rethymno is made up of beautiful cobbled streets, pretty pastel houses and a picturesque harbor. The city is known for a lively nightlife and has some fantastic beaches for you to spend days lounging on the golden sands. Rethymno has seen a tourism boom in recent years and as such, many hotels have been built along the coast and there is big selection of accommodation to choose from. Rimondi Boutique Hotel – The high-end hotel comes with all of the added comfort and convenience that you might expect from a 5-star hotel. Choose from either the more contemporary rooms with more polished interiors or from the older heritage style suites for a touch of old-world charm. Guests are welcomed into the calm of the hotel by professional and polished staff, who’ll serve wine and cheese upon arrival! Breakfast is served up on the outdoor terrace alongside the outdoor pool. Plus, the Venetian Harbour and the Old Town is just a five-minute stroll away. Achillion Palace – If you’re arriving by ferry, checking in at Achillion Palace is a great idea since it’s just a convenient 10 minutes on foot from the Rethymno Ferry Terminal. The rooms at this 4-star hotel are modern and contemporary in their decor and facilities and come complete with balconies that boast either sea or garden views. This hotel also features a restaurant, a bar, an outdoor pool, and a rooftop garden – as well as the all-important free breakfast. You can get into the history of this area at the Archaeological Museum of Rethymno, just 15 minutes’ walk away. Busy Heraklion is the biggest city in Crete and is a bustling urban center which has great transport connections. The modern city also has walled fortifications, an authentic market, interesting alleyways and archaeological museums. Chose a hotel near the old market or by the main square and check out the hip cafes, trendy boutiques and get lost discovering the city’s hidden treasures. Galaxy Iraklio Hotel – This elegant hotel provides an elegant mix of clean and contemporary style and spacious rooms. Staff are always available to help guests with any requests they might have and are very welcoming and professional. Sat in between the port and city center, staying here means you’ll be in walking distance of the old Venetian Walls and sights such as the Municipal Art Gallery. After a packed day seeing the nearby attractions, you can return to the hotel and enjoy a dip in the sizable freshwater swimming pool and dine in one of the two onsite restaurants. Castello City Hotel – The rooms at this 4-star offering come in a variety of shapes and sizes, from suites complete with balconies to family rooms which include sitting areas so you and your children will have enough room to spread out. There’s free parking (great news if you’re hiring a car) as well as a tasty complimentary breakfast served up each morning. You’ll also find a top-notch restaurant and bar on the top floor. 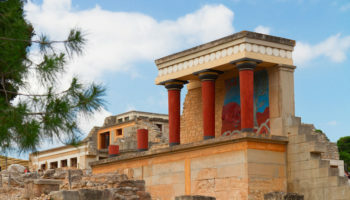 The picturesque Gulf of Heraklion is in walking distance, as is the Historical Museum of Crete. Infinity City Boutique Hotel – The on-trend interiors of this boutique hotel have been tastefully designed to seamlessly blend into the beauty of the surrounding scenery. Light wood ceilings, exposed girders, and pops of complementary colors make for an understated yet fashionable aesthetic throughout the hotel. Some rooms feature sea views and balconies, whilst others are simpler and more affordable. The hotel’s open-air terrace means that guests can soak up the sun with views of the sea whilst sipping on a refreshing drink from the bar. It’s also just a minute or two to the interesting Archaeological Museum. A cultural mix of creativity and leisurely lifestyle gives the town of Agios Nikolaos a unique dynamic identity. There is a lot to do in the small town – take a walk along the chilled waterfront, stop for some lunch at a waterside restaurant and watch the locals meeting up to do the same thing. 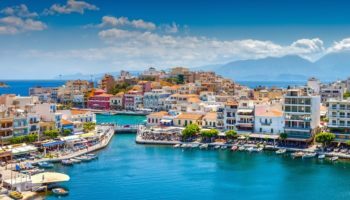 You can also take a ferry from the port to explore other areas of Crete and base yourself in one of the town’s smaller hotels or luxury boutiques. Minos Beach Art Hotel – A good place to come if you want to relax in seaside surroundings, there’s a beach within walking distance of the upscale Minos Beach Art Hotel – perfect for laying on the sand or splashing around in the sea. There are a few different types of accommodation on offer here, from suites to villas and bungalows for the utmost in privacy and seclusion. This high end 5-star offering features four restaurants to choose from, as well as no less than three bars to choose from, too. Miramare Resort – Set up on the hills about the beach, this hotel is all about amazing views of both Aghios Nikolaos and the Mirabello Bay. Select one of the charming rooms decorated in a traditional blue and white color scheme and be wowed by the spectacular blue of the sea. Some rooms even have access to their own small private pool that seems to almost blend into the sea below. The staff at the hotel are very courteous and friendly and create a relaxed environment so guests can enjoy their holiday in laid back luxury. The hotel is close to the sand of Almyros Beach and just over a kilometer to Lake Voulismeni. The agricultural center of Crete is the small town of Kissamos. Packed full of traditional Greek character, the town is a welcoming destination for visitors who want to soak up the authentic atmosphere of Crete. A hub for tourists, Kissamos has embraced Crete’s increase in tourism but has not let the influx of visitors ruin the towns traditional lifestyle. You can’t come to Kissamos without stopping off at one of the town’s pretty seaside tavernas and try out the delicious locally made wine and sundrenched olives that the region is famous for. There are many different accommodation options in the old town; you can choose from a range of different hotels and even, for those on a tight budget, dorm rooms. It’s a great idea to rent a car when you arrive so that you can explore other villages around the island and nearby beaches including the stunning Balos Lagoon. Balos Beach – If you’re looking for true seclusion, choosing to stay at Balos Beach Hotel away from the hustle and bustle of other busier towns on Crete is a great idea. It’s set on a peaceful peninsula, where you’ll also be able to hike (or drive) to Balos Beach to the north; you can also soak up some ancient ruins at Archeologikos Choros Kissamos five kilometres away. The rooms here are unfussy; you’ll also find an outdoor pool to relax in here, a restaurant and its own slice of private beach. The small town of Palaiochóra is built along the Libyan Sea on the ruins of an ancient city. The town has a relaxing atmosphere with everything you need to make your holiday comfortable. The well equipped, clean beaches have invitingly clear waters, making it perfect for families. The town is also home many different types of hotels to suit your needs – plus you can catch a ferry to other nearby towns. Libyan Princess – This central hotel has a wide range of facilities for guests to enjoy and is the perfect place for couples to take a relaxing break together. High end, modern rooms open out onto a chic outdoor pool area where guests can chill on sun loungers. There’s a small gym and spa with a sauna and hot tub. The whole hotel is maintained to a high standard and rooms are spotlessly clean for a super comfortable stay. The quiet location is a ten-minute walk away from many bars and restaurants, but just a few steps to two different beaches, Pachia Ammos and Chalikia. So here it’s easy to spend days on the beach. 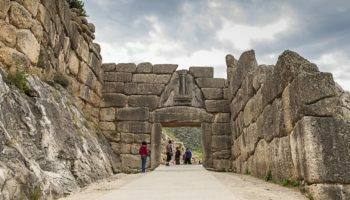 Spend your days in the popular resort town of Hersonissos lounging on the beautiful beaches, or sipping coffee in a cafe with a view – or you could take some time to explore one of the many archaeological sites in the area. You can even take a boat trip along the coast. As evening falls the town hots up and you can dance the night away in one of the towns nightclubs which attract young people from across Europe. Accommodation in the town comes in the form of coastal resorts and hotels. 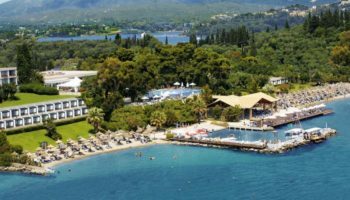 Creta Maris Beach Resort – With six restaurants to choose from, as well as six bars, too, plus its own disco and a relaxing spa, you’ll never want to leave this all-inclusive 5-star resort. It’s great for families since the beach itself is a mere 250 meters away, plus the Aquaworld Aquarium is just a ten-minute stroll from Creta Maris Beach Resort; but back at the hotel there are also so many indoor and outdoor pools to splash around in, including a total of 7 just for kids! Harma Boutique Hotel – Sleek and stylish, this hotel’s smart design makes it a calm environment to spend time unwinding in. Large wooden beds, modern mood lights and soft textures effortlessly complement the amazing views of the Cretan Sea. The hotel restaurant offers a wide selection of dishes throughout the day and the bar serves up great cocktails. Limenas Hersonissou Beach and Star Beach are in walking distance – plus there’s a bus stop just outside of the hotel which means it’s easy to explore the nearby towns. The small Cretan village of Plakias has seen a huge amount of development in recent years and is now a booming resort town. Popular with visitors who want to explore the island, Plakias is close to other interesting villages that still live in the traditional style. The town has many amenities and is a great choice if you are looking for a base for your family holiday. 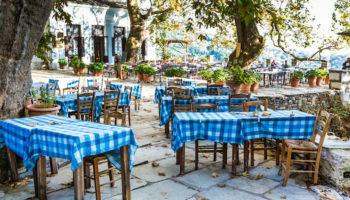 The streets are lined with fantastic restaurants and great hotels with many options to choose from to fit a range of budgets, and you can even catch a bus to nearby Rethymnon. Lamon Hotel – Arriving by ferry? 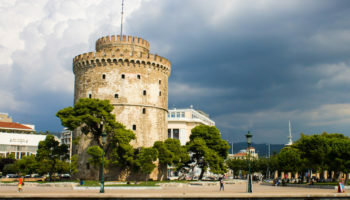 Lamon Hotel is a great idea, since it’s just a three-minute walk from the Plaka Ferry Terminal, making it extra convenient to stay at this family run hotel. If you plan on hiring a car, then it’s good to stay here too: the parking is free (oh, and so is the breakfast). This value for money option in Plakias features decent airy rooms that have balconies – the upgraded ones boast sea views. There’s also an outdoor pool to relax around here, and a restaurant that comes complete with dreamy panorama of the sea, too. The tourist magnet of Malia is a big draw for young tourists looking to let their hair down. Attracted by the massive white beach to soak up the sun during day and a raucous clubbing scene at night, the young people of Europe flock here to have some fun. Malia’s streets are paved with bars, cafes and restaurants all serving up everything you might need during your stay and there are many affordable hotels to choose from. It’s a good idea to hire a car in Malia so you can explore more of what Crete has to offer. Alexander Beach Hotel & Village – You’ll be quite literally spoiled for choice at this luxury offering in Malia – the choice is beautifully extravagant. There are a total of eight restaurants and bars, as well as five outdoor (and indoor) pools, a kids’ club, a spa – featuring a sauna – and its very own stretch of private beach. The rooms here are simple and sophisticated, but for an even more luxurious option you could go for a beachfront villa. Parthenis Beach, Suites by the Sea – Featuring studios that come complete with their own terraces (or balconies) as well as kitchenettes and TVs, staying at this apartment style offering is a great idea if you’re looking for an affordable stay. You can even opt for an apartment, which adds a separate living space and additional bedrooms: great for families or groups of friends. The laid-back atmosphere of this hotel continues at the restaurant and their own stretch of private beach. Elounda’s big attraction is its incredible landscape, built on the shores of a spectacular blue lagoon. The town is home to luxurious hotels which offer extravagance and comfort for a high-end price tag. The elite of Greece like to come and holiday here and stay in the five star resorts located along the coast. Catch a bus or rent a car and drive to other small towns nearby, or simply relax in the luxury of your resort. Blue Palace – Treat yourself to spa treatments (or go for a workout) at this upscale 5-star offering whilst your children have a blast in the kids’ club; this place is all about letting your hair down and not having to worry about anything. Even leaving the hotel! That’s because Blue Palace comes complete with three bars, five restaurants and its own private beach, among other things. Get truly luxurious at this beachfront paradise with a multi bedroom villa complete with its own terrace and BBQ. Enjoy long stretches of white sandy beaches and crystal clear shallow waters in the resort town of Kato Daratso. Just ten minutes drive away from Chania – and an easy bus ride to other nearby towns – Kato Daratso has some charming streets and traditional waterside tavernas to enjoy the island’s fresh food in picturesque settings. And when you need a place to stay you can choose from one of the many mid-range, family friendly hotels. Golden Bay – It isn’t the utmost in luxury, but the 3-star Golden Bay is well located – and that location makes it utterly perfect for beach bums: Glaros Beach is quite literally a stone’s throw from this place. You can choose from studios or, for extra space (perfect for families) there are apartments too. The restaurant and bar here are open air and offer up some lovely views of the bay nearby. There are gardens to stroll around in here, as well as an onsite grocery shop, which is great if you plan to keep costs low by cooking some of your own meals. Just a twenty minute bus ride to the historic attractions in Chania, the authentic village of Agia Marina will delight you with its quiet beaches, friendly bars and old tavernas. Stay in one of the small, relaxing family-run holiday hotels and spend your time taking walks along the water’s edge, dipping in and out of the small bars, sampling local cuisine, and splashing in the water on the family friendly beaches. 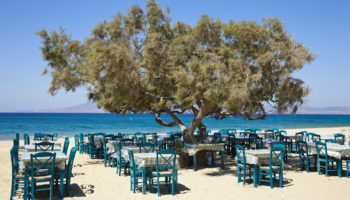 And, of course, you can always explore other towns that Crete has to offer – Agia Marina is well connected by bus and boat. Eleftheria Hotel – Eleftheria Hotel features chilled out, relaxed rooms that boast balconies, flat screen TVs, and comfy beds – the perfect combination for a nice base to come back to when you’ve had a day of exploring Crete. There are also family suites which, of course, offer up extra space. The breakfast buffet here is complimentary, which is a great start to a day of playing in the pool, the playground or seeing what the surrounding area has to offer (the coastline is a kilometer away). The holiday town of Platanias is split into two halves: a busy seaside resort with a buzzing nightlife scene, and a quaint old town with a carefree atmosphere. Thanks to this you’ve got the option to stay in one of the family friendly seafront resorts or in the old town’s quiet holiday apartments. Visitors are attracted to Platanias town for its long stretch of sandy beach which is dotted with laid back beach bars and eateries. And in the evening the town itself hots up with popular bars and nightclubs. 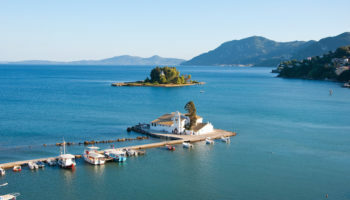 For those wanting to explore further afield, you can drive from Platanias to intriguing architectural ruins closeby and discover the remains of ancient civilizations, or you can take a boat ride to Chiana to visit the Venetian harbor. Sunrise Village Hotel – At Sunrise Village Hotel you can stay in studios or apartments, which is just the ticket if you’re planning on visiting with your family or a group of friends. It’s great value for money: since it’s all inclusive you’ll be enjoying as much food and drink as you like in the casual onsite restaurant. If you’re looking for seaside action, never fear – Platanias Beach is less than a 15-minute walk from this 3-star offering. Matala is a pretty coastal fishing village with a dazzling stretch of sandy beach which is scattered with beachside cafes, occasional massage parlors, and punctuated by the pink of tamarisk trees. The village became famous in the 1960s for its popularity with visiting hippies, and it’s clear to see why when you sit on the shores of the Libyan Sea and watch the sun set over the islands in the distance. Take time out and slip into the old world of Matala and learn about its links to ancient Greek mythology. Accommodation in the village offers up a stay in one of the many low rise, mid-range hotels houses in traditionally whitewashed buildings. Matala Bay Hotel – Value for money is the name of the game at Matala Bay Hotel; apartments here come with kitchenettes and there’s an onsite grocery shop, so you’ll be able to stock up on supplies to cook your own meals. You can also grab a drink at the poolside bar, enjoy a few bites to eat at the snack bar, dine in the onsite restaurant, let your kids loose in the playground, or simply head to Matala Beach – just seven minutes’ walk away.